Give Love To Your Digestive System | Gastrointestinal Specialists, Inc.
Now that February is here, everyone has love on the brain. While people are scrambling to get gifts for their sweetie, we often forget that we need to love our bodies as well. All too often, we get caught up in other things and forget the little things we need to keep going, like drinking of water or getting fresh air. Your digestive tract is a great example of a system of the body you should spend a little extra time on to keep it happy and healthy. 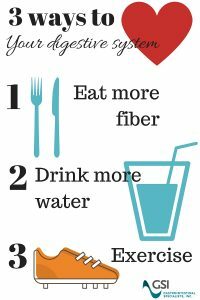 You can do this by eating a diet rich in fiber, drinking lots of water, and keeping active with regular exercise. Eating a diet rich in fiber has many benefits. Found mainly in fruits and vegetables, foods high in fiber help regulate the digestive system. They keep your body happy by getting rid of excess fat and bloating. Not only is fiber a necessary component for regular digestive health, but it also aids in weight loss. It fills your stomach, making you feel full, thus making you eat less. Those who have diabetes can benefit from fiber as well. Soluble fiber, found in citrus fruits and apples, dissolves in water and can improve blood sugar levels. Balance out your high fiber diet by drinking plenty of water. Water helps our body clean out toxins from the food we eat. Many nutritionists recommend drinking warm water with lemon or tea in the morning to help with digestion. This can get rid of waste buildup collected in our bodies overnight, and aids in constipation by stimulating bowl movements in our body. Round out your healthy eating and drinking with a steady exercise routine. Just 30 minutes of regular exercise a day increases your metabolism and helps your digestive system work more efficiently. The types of exercises that you do matter as well. Yoga poses that incorporate twists and turns, give your intestines a well-needed massage so they can relax and do their job. Exercising is good for reducing colon cancer and other cardiovascular diseases as well. Keep your digestive system in shape just by making sure you do more of these three things, and you will feel better and notice more regularity. How Much Halloween Candy is Too Much?